Finding one’s way back home is one of storytelling’s most popular themes, especially when a character, like the Little Prince, travels through galaxies to re-root physically, emotionally and spiritually. The Little Prince, the animated movie, directed by Mark Osborne and based on the 1943 for-children-of-all-ages classic by Antoine de Saint-Exupéry, uses a modern framework to introduce its iconic figure. A single mother (voiced by Rachel McAdams) is a frenzied executive who lives in a pants suit and is crazy-ambitious for her diligent daughter, The Girl (voiced by Mackenzie Foy), to get into Werth Academy. Mom’s strategy is imposing a life plan with inflexible study slots on the kid. What could possibly go wrong to make The Girl not stick with the plan? How about a propeller that crashes into the child’s home, courtesy of an old codger – known as The Aviator in his youth (voiced by Jeff Bridges) – who lives next door and who tantalizes her with illustrated pages of a story that tells of his long ago and fateful meeting with The Little Prince (voiced as a child by Riley Osborne). Despite her academic obligations, The Girl is seduced by the tale of the iconic inhabitant of a tiny asteroid that’s overrun with plant growth, and who leaves the place to escape the vanity of The Rose (voiced by Marion Cotillard), his only companion. Along the way, he meets up with fanciful creatures like The Fox (voiced by James Franco) and The Snake (Benicio Del Toro), as well as some ogres (voiced by Ricky Gervais, Bud Cort and Albert Brooks). 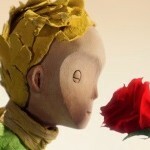 Not surprisingly, The Girl is impassioned to find The Little Prince, now an adult (voiced by Paul Rudd). Flying a plane is involved. The burning question that Werth – a play on “worth” and “Wordworth” – wants its pupils to answer is: What will you be when you grow up? 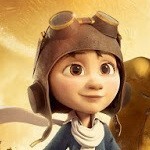 With any luck, suggests The Little Prince, an apt student fiercely clings to childhood’s magic birthright.